T'ain't raining, Zoe's curiously clean and there's only me and the boy Andy. Just the two of us, we can make it if we try. Loose dart is pointed to Darsham destinations, though neither of us is sufficiently minted today for the infamous still-to-do Darsham Nurseries Cafe. Bracket, not really a cafe, bracket. Straight thirty through Farnham -- note, not driving at 90 down country lanes, Ed -- and over yonder is the day-of-the-week turning for Friday Street and Snape. 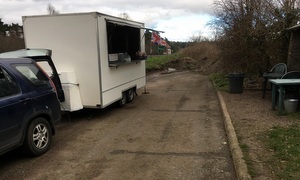 Our driver spots something else of interest, however: there's a burger van of sorts parked in the lay-by. There's limited signage today but, unmistakably, in a tribute to my mother-in-law, that must be Jan's Baps. Narf. With a coupla lorries already there, Andy's all-electric city car fits in nicely. You must be Jan, I say, The same, she says. What can I get you lads? Baguette, burger, bap? Well, has to be the bacon and egg bap, ta very much. Butter for me, please, but none for slimfast Andy. Ooh, and a Dr Pepper, please. Facing Jan's open-sided van are some plastic tables and chairs within a three-sided shed, somehow still standing (like Elton) after yesterday's Storm Doris. Come in, it says, I'll give you shelter. Top bap, needless to say. Doesn't food always taste better outside? Previously the Pit Stop, Jan bought this business as a break from caring and loves the change. Busier in winter, oddly. Proper mug of instant coffee before we head off with some solid stodge in the form of prepack Bakewell and treacle tarts, split messily down the middle-ish. Sets us up pretty well for a Friday pm dozing at the desk. If you're in the vicinity, Jan's your man. If it was a car -- Hyundai Tucson. If they were passing by -- Jan Harvey.